An independent US study published in 2016 by FACTS confirms sympto's superiority : Sympto is rated as the best symptothermal app ! According to the rules by Rötzer/NFP-sensiplan, the apps identify the evening of day 16 as the passage from the fertile phase (blue) into the postovulatory infertile phase (yellow). However, CyclePreGo liberates only at day 17, in the morning. We did not penalize CycleProGo for this delay however it may be a major inconvenient for the couple’s love life. We can notice that the absence of cervical fluid ('elixir') throughout day 7 and 8 shows that the woman is not fertile these days. On sympto, the woman receives special educational messages asking her to check the occurrence of fluid, which would open immediately the fertile window regardless of the later Döring-day. This case illustrates the importance of an accurate elixir observation during these early cycle days. The other apps do not send any message of this kind. Due to his feature sympto received a special bonus in the criteria 'user friendliness'. 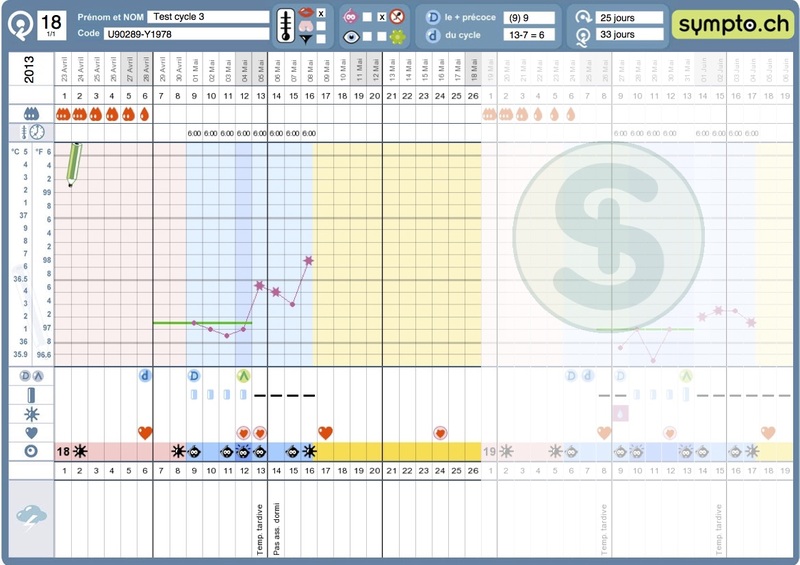 Sympto : 1) In cycle 13 (not visible here, see downloadable charts above), both sympto and myNFP liberate 7 infertile pink days. But sympto, in cycle 14 to 18, liberates five times an additional 8th rose infertile day because of the 12 preceding cycles (from 2 to 13), based on the sympto principle: the temperatures rises of the preceding 12 cycles provide the basis for the calculation of the rose preovulatory infertile days. 2) You can see on this cycle chart that this high score 8 will be abolished in the following cycle 19. How that? The temperature rise displays the little d (Döring day) on day 6 and leaves only 5 pink infertile days left in the following cycles: this result stays until the end of her observations! MyNFP : NFP-sensiplan is the reference for this comparison study .1) myNFP follows exactly NFP-sensiplan in this but in not all other regards. 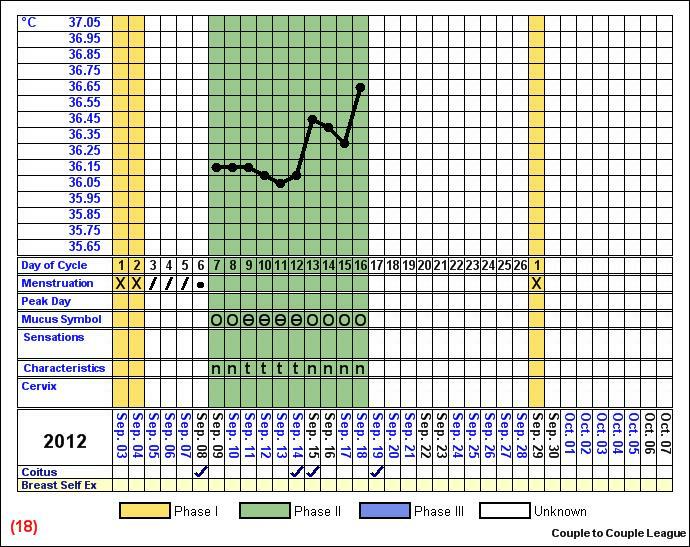 You see only seven infertile preovulatory (green) days because the sensiplan rules keep the record of the shortest temperature rise of 12 first cycles. This restriction explains the 5 false negative days on sympto (cycle 14 – 18) in this study. 2) myNFP identifies day 13 as the first temperature rise of this very cycle, but does not make visible its management by displaying the little d (Döring day), visible only on sympto. The restriction of the following cycle however is the same: only 5 preovulatory infertile days are liberated. 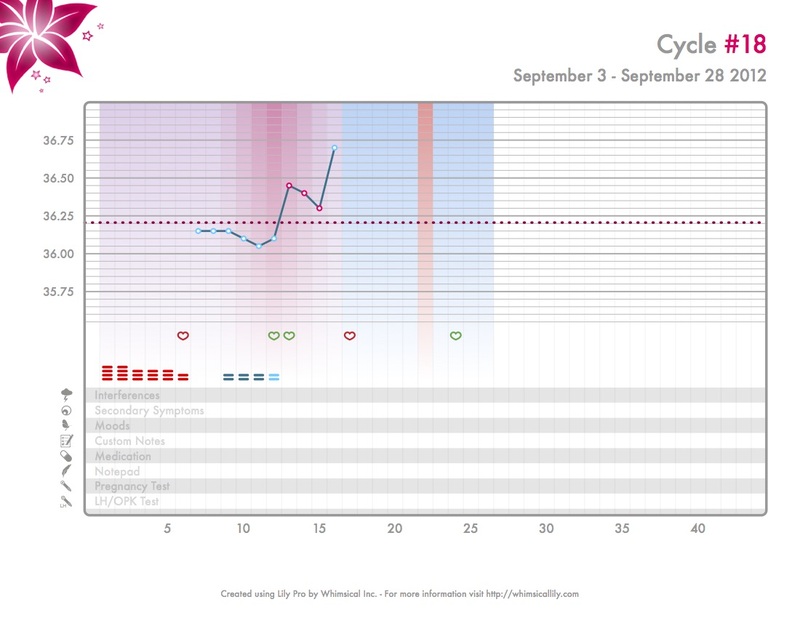 After 12 cycles, from cycle 31 onwards, myNFP will never release more infertile preovulatory days like on sympto. CycleProGo : The beginning of the fertile phase starts at day 7 already but it is preceded by white days – white meaning without any interpretation, and only two days are clearly indicated as infertile (yellow days). In addition, the infertile postovulatory phase from 17 onwards remains white, meaning: no clear interpretation given! We supposed it to be infertile. Lily : does not liberate any infertile preovulatory day for mysterious reasons.